We stock Pipe & Drape rigging systems for hanging drapes, sheer, starlight wedding cloths, blackout cloth or any light weight fabric. By using pipe & bases, Drape can be rigged from ground height and extended as high as 17'. Pipe & drape systems eliminate the need for rigging points in your venue and save on space, as drape can be safely rigged to sit right against walls. Our pipe & base systems consist of 7' - 17' (2.1m - 5.1m) extendable uprights, which use a unique none-slip collar allowing drapes & cloths to be extended to meet any ceiling height. Each upright comes with a heavy base plate, complete with handle for ease of use and multiple fixing points. Extentable cross peices are avaliable from 3' to 12' (0.9m - 3.6m) in length. Pipe & drape rentals are avaliable for Pickup from our Warehouse, or installed by our experts. We have white and black drape, Sheer, we also supply black out drapes, white/ivory drapes. Our LED drape/ starcloths are a perfect backdrop for stages, behind bands, DJs, Comedians, fashion shows, for blocking off unsightly walls in buildings, dividing rooms into 2 and as a starlight roof in venues and marquees. They are ideal for wedding receptions, private parties and corporate events. We can supply both the traditional black wool serge star cloth as well as an ivory coloured or white LED star cloth which is very popular with wedding receptions. 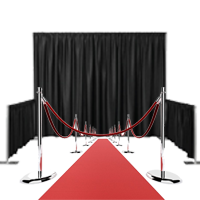 VIP Red Carpet rental, Ropes and Chrome/ Brass Stanchions. If you must have red carpet at your event, you are in the right place! Our red carpets are NOT CHEAP FELT, but luxury pile! Soft and luxurious. However, our prices are very competitive! We offer our red carpets in manageable sizes for you to roll out yourselves, and also offer larger bespoke carpets. Please contact us for a free quotation.